15,000 Mile Service - Orinda Motors Inc. The 15,000 mile service is an intermediate auto repair service, and likely the first one for your vehicle. 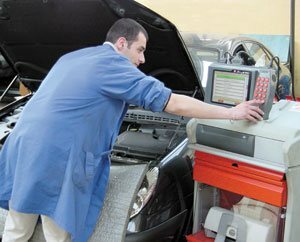 Depending on what is recommended by the Owner’s Manual for your car, the 15,000 mile service generally involves an oil and filter change, tire rotation, and a safety inspection, as well as possible replacement of the engine air filter and cabin air filter. While changing the oil, Orinda Motors will be performing visual inspections of the brakes, belts and hoses, inspecting for any fluid leaks, listening for any abnormal noises, and paying attention to any irregularities in the operation of the vehicle. Our Orinda Village location has a comfortable waiting area and is located near several stores and restaurants, Safeway, Starbucks and the Orinda Library, so you can go explore the area or catch up on work while you wait for your 15,000 mile maintenance to be complete. If you choose not to wait for the completion of the 15,000 mile service, we offer a free shuttle to BART, home or work. We also offer pickup and delivery of your vehicle for no extra charge! If you need a car, we also have Orinda Auto Rental located on the premises. Orinda Motors offers all of the services required for your vehicle’s 15,000-mile auto repair service. It is our goal to always provide great customer service and high-quality workmanship with the best value possible. If your vehicle is ready for its 15,000-mile service, either schedule an appointment, call us, or stop by for a visit at 63 Orinda Way, Orinda, CA 94563.